From a quick and inexpensive "Baking Beauties" class to a hands-on chance to create a three-course meal, the long-established Matters of Taste Cooking School has something to offer everyone. We attended a hands-on class on Vietnamese cooking on a weekday evening. We arrived to find the articulate and confident young presenter running through an introduction to the fresh and fragrant cuisine, shortly followed by a few safety guidelines. It all felt a bit Masterchef-ish and I got a bit apprehensive looking at the stack of ingredients, utensils and recipes in the middle of my "prep" table of eight. There was also a "work order", a useful run-down of what to do in what order and at which time, across all the dishes - something that could be useful even in a dinner party situation. Luckily, each person was not expected to cook each of the three dishes - we split into teams and did one dish each, under the watchful and helpful supervision of the teacher and two assistants. With 18 student and three supervisors, the space was a little cramped - but everyone managed to get sufficient cooking room on the two stoves. The dishes we cooked - or at least ate - on the night were steamed seafood rice noodle rolls, Vietnamese chicken with lime, chilli and coconut rice and pho - which is apparently pronounced "fur" not "fo". All the dishes were delicious and there was plenty enough for a full meal around the prep tables, cleared of cooking apparatus and set for dinner. You can BYO wine or beer. 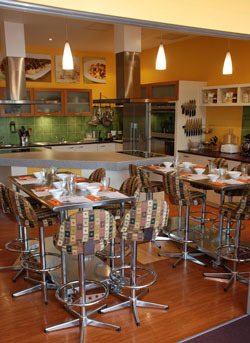 This cooking school also offers corporate events and classes in bread-making, pasta-making, Thai, French, Japanese and more. It'd be a fantastic interactive date, get-together with the girls or mum-and-daughter event. 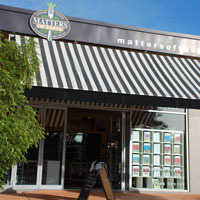 Gift vouchers are available. On the night we attended, there were three couples, a mum-and-daughter pair, a smattering of retirees and a new mother out alone for the first time since giving birth. Why? Learn to cook and get to eat! When: There are weekend and weekday classes, both during the day and at night. See website for details. Cost: From $25 - $120.